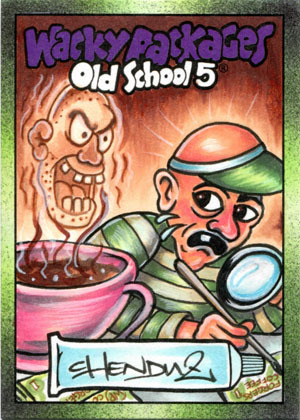 I recently worked on the Wacky packages Oldschool Series 5 sketch cards. A few people asked about my return cards, that's why I started this topic. I used copic markers, acrylics and I airbrushed the background. I want to give the forum members first hand here before I'll send him off on ebay. That's really nice. I'll be on the lookout when you are ready to auction. Thank you very much BumChex! Unfortunally this card won't make it to the auction, cause it is sold already. Thank you very much!! ..... The stars are going in infinity circles ........ Woozy as Willy! That's great! The Topps line is just too funny!! Return card #5: "Mosquita takes on Woozy Willy"
And proud to tbe the future owner of that beauty as soon as she makes it across the pond. Toadal is back by dope demand! Great, great sketch cards! Very refreshing to see your take on some of the classic titles! Thank you very much, that means a lot to me! I can't wait to draw more of those classic characters, They are the best! Thank you Jon, your doing a pretty great job yourself, keep them coming please!! Vincenzo, just terrific! I love the airbrushing in the background. The 1970's Wacky's used a ton of airbrushing and it's something I wish would make a comeback. Thank you Joe!! I love the old classis WP's the most of all. Altough Mosquita, Nyt-Owl and Woozy Willy are def amazing new characters, with that Oldschool feeling, thanks to Dave Gross!! do as....... Chenduz is dancing the funky chicken! 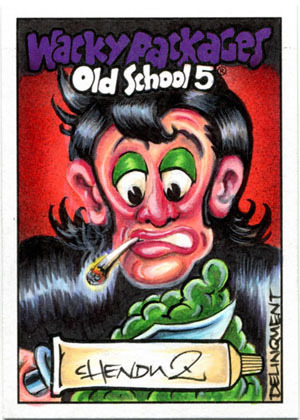 * The planned but cancelled Wacky Packages Star Wars series? 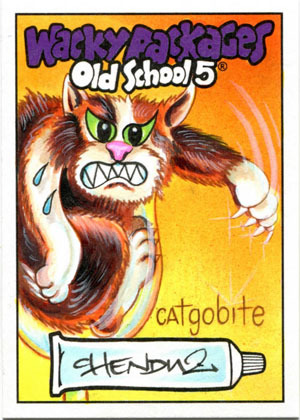 * The upcoming 2014 Wacky Packages series? *I have not worked on any Wacky Packages Star Wars series. BTW.... I wish you all good luck on pulling them, these cards are all inserted into the packs!! Return cards are coming soon!! Have a great and wacky hunt!